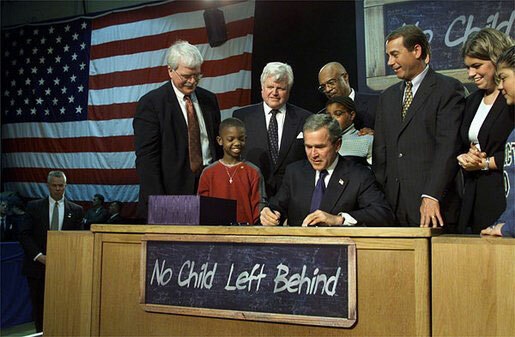 The No Child Left behind Act of 2001, established during the Bush administration would ensure that all children receive fair and equal access to quality education. More specifically, in 2002, the policy required that all states test their students in reading, and math starting from grades three through grade eight, and again when the student reached high school level where students were to meet or exceed reading and math requirements. In addition, the act would help close the gap of achievement for students [according to the United States Department of Education] by providing quality education where focus was on (a) accountability and assurance to disadvantaged children, (b) flexibility that allowed federal funds to be used to improve student achievement, (c) research based education which placed emphasis on programs and practices that proved effective through scientific research, and (d) parent options which provided choices for Title 1 school parents (No Child Left Behind Act 2001). However, at present, the policy though well written has not taken shape, and neither has there been offered relief to support all students for which the policy was created other than to transfer a student passing from the school where the environment has become academically unsafe. Moreover, because of racial disparities and economic conditions such as poverty in districts the children are further subjugated to even poorer learning environments where there are meager classroom materials and less than adequate instruction. Therefore, this article will propose change to the current policy, an amendment; along with, recommendations to abolish areas where the policy has been breached by providing information which is overlooked and or ignored in current more up to date research concerning the No Child Left Behind Act overall. Firstly, there are a number of reoccurring problems with standard testing as it pertains to the NCLB Act, and these must be dealt with to ensure that all students taking the exam have equal success. It is the case, that nearly every child entering the public school system [particularly] among the African American and Hispanic students exhibit ongoing failure even while there is instruction for the same. Hence, the occurrence of such failure among the students would beg the question to ask is it really a fact that students are dumb or dumbed down? Reportedly, blacks currently score lower on vocabulary, reading and math tests; including, measurement of aptitude and intelligence than European Americans, and the authors stated that “On some tests the typical American black still scores below 75 percent of the American whites on the same test (Jencks & Phillips, 1998, para.1). Accordingly, teachers/educators are required to ‘teach’ the test rather than teaching regular curriculum that stimulates the intellect, or creativity in the student. It is the case that much of the school year is taken over with this type programing, and the morale of both students and educators is low because of failure to pass the test. Hence, armed with this information the premise of reauthorization of the act is of no regard. Consequently, the premise of reauthorization only acts to restore previously enacted documents which to date have failed to yield positive results. As a result, the failure of the practice in testing students has not fulfilled the element of improved research. Therefore, a total amendment, and or more acceptable replacement is needed. Secondly, the promise to close the achievement gap as enacted by law has failed, and reportedly, the gap has not been lessoned for years. According to a New York Times (2009) article, “’No Child’ Law is not Closing the Racial Gap”, it is apparent there has not been an improvement in years. Between the year 2004 and 2009 when the article was written that even though black and Hispanic elementary, middle and high school students all scored much higher on the federal test than three decades ago most of the gains made were not recent but during the desegregation efforts of the 1970s and 80s and was well before the No Child law which in the official description admonishes to close the achievement gap (Dillon, 2009, para. 3). Begun and held at the City of Washington on Wednesday, the third day of January, two thousand and one. To close the achievement gap with accountability, flexibility, and choice, so that no child is left behind. Be it enacted by the Senate and House of Representatives of the United States of America in Congress assembled [No Child Left Section 1]. According to the Center of Education Policy (as reported by USA Today), there are 43,000 schools in the US that fail, or have failed which means 48 percent of students have made no progress since the enactment of the law. This information is troubling, because the only relief noticeable to parents is the opportunity once a child fails to transfer to a district passing. Hence, this too brings problems added to problems when transportation becomes a problem. Nevertheless, the report is telling that in Wisconsin (for example) the failure was extremely low at 11 percent. In explanation, of the failed standards for the federal exam policymakers have predicted failure rates of 82 percent, however, there are claims as well that the statistics are in error. In essence, to keep with the premise of requirement by law that every student perform at grade level by the year 2014 is impossible and has failed according to some educators (USA Today, 2014, para.1). State requirement to raise expectation in the number of students who pass each year (USA Today, 2015, para.6). As a result, of these facts, the essence of the federal law which is intended to close the achievement gap by realizing equal achievement with regard to students at disadvantage has failed and is biased. Removing the requirement for annual testing would be a devastating step backward, for it is very hard to make sure our education system is serving every child well when we don’t have reliable, comparable achievement data on every child every year,” Kati Haycock, president of the Education Trust, said in recent testimony before the Senate education panel. Her group joined 20 civil rights organizations to lobby Congress to keep the requirement to test all children each year in math and ­reading (Layton, 2015, para. 4). However, is this statement a fair assumption to say that the removal of the federal test is against civil rights? Conversely, teachers agree that teaching the test while forsaking the art of creativity and free expression surely takes away human rights of the student to think for themselves. In an interview, a former educator and social worker detailed what many instructors go through in teaching and testing. During her interview, Jacqueline James (2015) was asked to (a) Recount factors of her work, (b) Factors leading to the testing being biased in her opinion, (c) Why she left the school system, (d) What the morale was like for students and faculty, and (e) Suggestion of changes that would contribute to the law. My name is Jacqueline Jordan. I have five years experience in the school system, including, elementary, middle and high school education. I held positions as substitute teacher, assistant and as a social worker. I also hold a Bachelor of Social Science with a minor in Education, and a Master of Education with a minor in Public Policy; as well as, a Master of Organizational Management. As an educator, some of the main factors that were attributed to our work was tied to testing. Hence, the main issues were that I and other educators were frustrated that our students’ performance was not meeting expectations. Conversely, exam scores were lower than previous years and we spent many days and months trying to figure out why our students were struggling, and after interviewing students in their perspective classes and schools we were told that they did not understand the question. Therefore, it was determined that the questions on the tests had nothing in common with how certain groups of children think or rationalize. I feel the testing is biased due to the overall testing results for students who otherwise pass their assignment during the entire school year only to take the test and fail. Moreover, the testing is set for certain populations of students who may be at a disadvantage. Hence, from my experience many racial minorities struggle to pass the test because of no relation to what they have learned, and neither to their personal lives. This too, is one of the reasons I left the district, because I feel it is not fair to our minority students. Honestly speaking, the morale for the majority of faculty was low because of dissatisfaction in the work. Consequently, low morale among the faculty was the reason for high turnover in staff and low performance, and frankly, from my viewpoint the student morale was lower due to many not being able to understand, nor, were they accurately understand the assignments given. Hence, this occurrence caused behavioral issues, students skipping class, incomplete assignments and or unfocused students without the ability to engage. Therefore, all this overall also caused parents to feel as if their children were not being effectively taught by the school system which added to all parties being frustrated—parents, students and faculty. In general, the environment for most students was stressful due to non-relational material. Teachers should not have to teach from a manual and or for a test. The material learned should be based on real world solutions. The students success and being promoted should not be based on the one test, especially when the student works diligently throughout the year to pass their assignments otherwise (Jacqueline Jordan, interview by Kayla Daily, October, 11, 2015, 4:19 p.m., interview Electronic Communication). A fifth reason, brings attention to a telling fact of how the academic success of students may be hampered is the myth that black students are not as smart as white or non black students, and this assumption may certainly seem realistic if one places judgement in relation to test scores, however, one would have something other than assumption to rely on. Jencks & Phillips (1998) argued that theorists promote the idea that low scores are attached to family background and or family environment which can be taken generally to say that all black people are dumb, unable to learn, and thus, unable these factors in turn can affect; or rather, do affect test scoring. In 1978 the Nigerian anthropologist John Ogbu suggested that cast-like minorities throughout the world tended to do poorly in school, even when they were visually indistinguishable from the majority. Later, Ogbu argued that because blacks had such limited opportunities in America, they developed an ‘oppositional’ culture that equated academic success with ‘acting white’ (Jencks & Phillips, 1998, p.6, para.4). In general, the rejection of assumptive views tend to hide bias, or rather lend to biased thinking, and along with the awareness that there may bias lurking amidst the exams one can also be aware that text books containing the answers are not made available to the impoverished districts. In her interview, Jacqueline James (2015) alluded to that fact saying that ‘the children’ said they did not understand the questions (James, 2015). Hence, this begs the question that asks if the children do not understand even though the educators are teaching the tests then there is more than an agenda set up for their fail, and why is there a manual to teach from instead of a book? Could it be that the curriculum for the exam is not being taught? In this instance, a proposed plan for a policy amendment or rewrite is simple, either stop the federal exam or make the materials needed for the exam available to all students everywhere. In other words, there is no gap if there is not one continually created. Accordingly, the US Department of Education has promised equal access to education for all students. Hence, if one is to support the breach in civil rights as advocacy outlines then one would need to consider the evidence presented speaking of no access to testing materials equally, and the propensity that the teachers are given manual over the actual textbook. Therefore, the premise of testing as a civil right has been breached and has failed, because not only are teachers hindered but there is pressure for them to teach what they do not know may be the wrong material. In an article, there is evidence that federal funding may be misappropriated. Hence, with funding and budget cuts so steep there must be need to look further into the matter. It is the case, that “Prior to 2001 and the implementation of the law that appropriations went up only $3 billion per year”, however, after are up 64% according to a CBS News report. Elizabeth Harrington (2011) wrote that from the years 2000 to 2001 the appropriation rate increased by 9%. However, after implementation of the program appropriations were up to 33% which is $42 billion (2001) and climbed to $56.2 billion (2002). Hence, it is notable that more funds are spent yearly, yet, the children fail more so even with all the programming. 2010 – $63.00 billion (Harrington, 2011, para.4). There is no need to address the overall budget implemented concerning the NCLB when there is evidence of an astronomical amount of federal dollars spent even while the children fail at a rapid pace yearly. Hence, this begs the question where does the money really go? There is no reauthorization needed, no restore of the same disparaging occurrence as it relates to the law. That said, policymakers must address these issues immediately and reconsider their programming is not working and is wasting away tax payer dollars. Lips & Fienberg (2007) wrote, that “Federally funded full time employees in state education agencies worked to implement education programs three times more than the number of employees working at the Department of Education (Lips & Fienberg, 2007, para. 3). Hence, here are workers making money for programing that is no good when the consideration should be on the text books, and other needed materials that make for a successful test score. There has already been evidence brought that the children understand that they do not understand the questions on the test when they have worked all year to learn. In essence, more money should be spent in the school to pay the districts’ teachers, and less money for programming that does not work. Therefore, the only cut to budget should state in policy to quit bogus federal government expenditures, because after all paying the teachers and funding the school so that all is equal access is the mission of NCLB. The NCLB has failed to do what it was created to do in closing the achievement gap academically, because the children still fail and is in breach of promise. There is variance in the degree of difficulty involving the exam across states which promotes the premise of biased testing standards and is in breach of policy as the occurrence does not promote equality; and, which leads to a breach of civil rights. The academic success of students has been hampered severely because of myths that non whites cannot learn as favorably as white students. Hence, this thought is promoted further as it relates to tests scores more favorable to the white students. There is evidence that federal budget as it pertains to NCLB may be misappropriated where money is spent implementing programs rather than actual research to find error in testing. Finally, as it pertains to amendment the NCLB has left a disparaging mood among educators across the nation to adamantly lift up a cry out for those who stand to lose more from standardized testing. It is the case that the states have failed the students of which the need for educational equality is upheld. Hence, for blacks and other minorities who will take their place in the world, that is, a world in need of equality where their fate should not be determined by a test. Hence, the premise of education and all its characteristics should say in policy all is equal, and not according to multiple choice, unless the multiples of choices are discerned from a creative mind with the ability to think its way through the problems presented with logic and sound reasoning. Policy makers should then, take the evidence presented here; along with, the research provided to make sound judgments and see that what is happening in the school system is questionable, and is not equal access as the law is written. Rewrite it then, make it plain to all that you mean what you say is the cry of all who speak of civil rights, on the streets and now in education. Notably, change will come—with an equal policy that truly stands with all accepted as equal. Is it a student’s civil right to take a federally mandated standardized test? This entry was posted in Black Culture, Black History, Business, Business Law and Ethics, Civil Rights, Community, Culture, Education, Employment, Environment, Equal Rights, Ethical, Family, Home, Mental Health, Personal, Political, Professional Blog, Profile/Feature Story and tagged African American, African people, America, American, Black people, budget, Children, community, Congress, Democratic, federal law, policy, public funding, public schools, Public Schools System, republican, Standardized Tests. Bookmark the permalink.